TTD calendars and Dairies for the New Year 2018 are available for online booking. All the registered and non-registered users can use this new service. 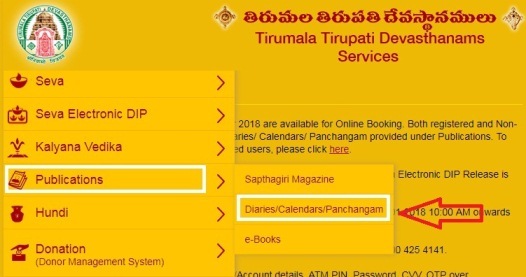 To facilitate the pilgrims to book TTD calendars and Dairies through online, the temple management opened up the facility in its official website from 7th December 2017 on wards. How to place the order online to get the TTD calendar 2018? In this we provided you the information about how to book/buy the TTD calendar 2018 through online. For all these questions we are given full detailed procedure below. How to Purchase TTD Calendar 2018 Buy Online? The below is the process to follow to book the TTD calendar 2018 through online. To book the TTD calendar for the year 2018 through online first of all you have to access the TTD seva online website through your web browser in your desktop. And then place the cursor on the small images which are displayed on the left side of the page. Then the lists of option will open in that choose for the publications, in that options choose for the sub option diaries/calendars/publications and click on it. It will direct you to the Diaries/Calendars/Publications page. Read the instructions before placing the order which are provided in the first column. And in next column you will be provided with three columns 1) Dairies 2) Calendars 3) Panchagam. In the subcategory give the quantity of which you want in the box provided. And then click on the proceed option. In the next page you have to enter the name and postal address at which you want to deliver. All the * marked boxes are mandatory to fill. And click on the continue option. It will direct you to the payment gateway. In which you have to choose credit or debit card as your possibility and complete the payment process. By paying the amount your order will be placed and that process of booking is completed. After that your order will be delivered within the 7 working days to your shipping address. Before placing the order make sure that you have entered the correct shipping address or not. This is the Above Given procedure to book/buy TTD calendar 2018 through online websites.